The Soyuz TMA-09M (No. 709) spacecraft, scheduled for launch on May 29, 2013, had a goal of delivering three members of the International Space Station crew, who represented the 36th and 37th long-duration expeditions on the orbiting outpost, where they were expected to remain until November 2013. The Soyuz-FG rocket carrying the 7,220-kilogram Soyuz TMA-09M spacecraft from Baikonur to the International Space Station, ISS, lifted off as scheduled on May 29, 2013, at 00:31:24 Moscow Summer Time (4:31 p.m. EDT on May 28). After a liftoff from Site 1, the launch vehicle ascended along a standard trajectory delivering Soyuz TMA-09M into its initial orbit. 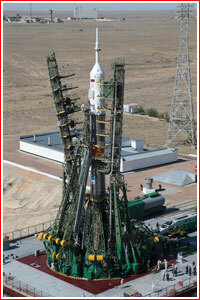 The spacecraft successfully separated from the third stage of the launch vehicle at 00:40:12 Moscow Time. Six hours or four orbits later, the Soyuz TMA-09M docked at the MIM1 Rassvet module, a part of the Russian segment of the ISS, at 06:10 Moscow Time on May 29 (9:10 p.m. Houston Time, 10:10 p.m. EDT on May 28), some six minutes ahead of schedule, as two vehicles were flying over the Pacific. With the departure of the Soyuz TMA-08M spacecraft in September 2013, three members of the Soyuz TMA-09M spacecraft would officially start Expedition 37 onboard the ISS. On the same month, the Soyuz TMA-10M is scheduled to deliver three additional members of Expedition 37 to the station, who would stay onboard until March 2014. Soyuz TMA-09M and its crew were expected to remain on the ISS for five and a half months until November 2013. As of April, 2013, the landing was expected on Nov. 12, 2013. On June 6, 2013, Expedition 36 Flight Engineers Fyodor Yurchikhin and Aleksandr Misurkin conducted a spacewalk 6-hour, 34-minute spacewalk, starting with an opening of the hatch of the Pirs Docking Compartment at 9:32 a.m. EDT, NASA reported. Yurchikhin and Misurkin conducted the excursion to prepare for the addition of a new MLM module officially scheduled for launch at the end of 2013, however, in reality already postponed well into 2014. During the spacewalk, cosmonauts replaced an aging fluid flow control panel on the station's Zarya module as preventative maintenance on the cooling system for the Russian segment of the station. They also installed clamps for future power cables as an early step toward swapping the Pirs airlock with a new multipurpose laboratory module. Yurchikhin and Misurkin also retrieved two science experiments and installed one new one. The spacewalk was the 169th in support of space station assembly and maintenance, the sixth for Yurchikhin and the first for Misurkin. Yurchikhin wore the Orlan-MK spacesuit with red stripes and Misurkin wore a suit with blue stripes. Both spacewalkers were equipped with NASA helmet cameras to provide close-up views of their work. This was the second of up to six Russian spacewalks planned for this year. Two U.S. spacewalks by NASA's Chris Cassidy and Luca Parmitano of the European Space Agency are scheduled in July. Meanwhile inside the orbiting laboratory, the other four Expedition 36 crew members, Commander Pavel Vinogradov and Flight Engineers Chris Cassidy, Karen Nyberg and Luca Parmitano, provided spacewalk support and continued their work on a variety of science and maintenance activities. During the spacewalk, Cassidy and Vinogradov were isolated in their Soyuz TMA-08M spacecraft that is attached to the Poisk module on the Russian segment due to the closure of hatches to the other passageways on the Russian side of the station. Parmitano and Nyberg were free to move about the U.S. segment of the station since their Soyuz vehicle (TMA-09M) is docked to the Rassvet module on the Earth-facing side of the Zarya module. Parmitano and Nyberg participated in vision tests as part of the crew Health Maintenance System. The data collected was then downlinked for analysis by medical ground support teams to study the effect of microgravity on sight. Nyberg also worked with the Advanced Colloids Experiment which observes materials containing small colloidal particles and how their physical properties behave in space. Cosmonauts completed their spacewalk at 4:06 p.m. EDT when they closed the hatch to the International Space Station’s Pirs docking compartment. On Aug. 16, Expedition 36 Fyodor Yurchikhin and Alexander Misurkin made another spacewalk from the Russian segment of the ISS. They opened the hatch to the Pirs docking compartment to begin their spacewalk at 10:39 a.m. EDT for a planned 6.5-hour EVA rigging cables for the future arrival of a Russian MLM Nauka laboratory module and installing an experiment panel. According to the plan, the cosmonauts were first to set up a Strela cargo boom on the Poisk mini-research module so Misurkin can maneuver Yurchikhin with cables to the Zarya FGB module near the Unity node. Yurchikhin was then to begin rerouting a cable connector and installing cables on Zarya. While Yurchikhin was working on Zarya, Misurkin was to install an experiment panel on Poisk. The experiment, named Vinoslivost, exposes materials to the space environment so scientists can study the changes in their properties. He will then install two connector patch panels and gap spanners on Poisk. After completing the Poisk work Misurkin was to join Yurchikhin and assist him with the Ethernet cable installation work on the Zarya cargo module. The duo will go back and forth between Zarya and Poisk routing and installing the cable at various points and securing the cable’s slack. Once the cable installation is complete the spacewalkers were scheduled to translate to Pirs and conduct an inventory of their spacewalk tools. 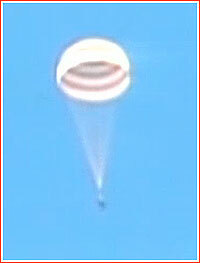 The duo was then to reenter Pirs and close its hatch officially ending Russian EVA 34. If Yurchikhin and Misurkin were ahead of their timeline they may be able to reposition and stow the Strela cargo boom. The cable work outside the station’s Russian segment was to prepare the orbital laboratory for the arrival of the MLM Nauka module. For the duration of the spacewalk, station Commander Pavel Vinogradov and Flight Engineer Chris Cassidy were isolated to the Poisk module and their Soyuz TMA-08M spacecraft, while Flight Engineers Karen Nyberg of NASA and Luca Parmitano of the European Space Agency will be free to move about the US segment of the complex. Yurchikhin and Misurkin returned to the ISS and closed the hatch on Aug. 17, 2013, at 02:05 Moscow Time after a 7-hour 28-minute spacewalk. According to schedule, the hatch closure time was 01:19 Moscow Time, however the cosmonauts needed more time for the power cable routing work to support the arrival of the MLM module. The spacewalk was the 172nd in support of station assembly and maintenance, the seventh in Yurchikhin’s career and the second for Misurkin. The two were scheduled to venture outside Pirs again on Aug. 22 to replace a laser communications experiment with a platform upon which a small optical telescope was to be mounted during a future spacewalk. On Aug. 22, 2013, two Russian cosmonauts clad in Orlan spacesuits began their second spacewalk within the span of a week when they opened the hatch to the International Space Station’s Pirs docking compartment at 7:34 a.m. EDT, NASA announced. According to the agency, during their excursion slated to last about five hours, 40 minutes, Expedition 36 Flight Engineers Fyodor Yurchikhin and Alexander Misurkin were to replace a laser communications experiment with a new platform for a small optical camera system, move a foot restraint and inspect several sites for the origin of a wayward antenna cover observed on August 19. As the two spacewalkers move out to the first work site on the Zvezda service module, they were to carry a combination EVA workstation and biaxial pointing platform upon which a small optical camera system was to be installed during a future spacewalk. After attaching the assembly to a temporary stowage location, Yurchikhin and Misurkin had to remove the External Onboard Laser Communications System, which was installed on Zvezda in August 2011 during an Expedition 28 spacewalk. With the laser communications experiment removed and temporarily stowed with its protective cover, the two spacewalkers were scheduled to install the camera platform and connect its associated cables. Once those tasks were completed, Yurchikhin and Misurkin would head out to the aft end of Zvezda to inspect three of the module’s six WAL antenna covers. Flight Engineer Chris Cassidy observed one of the covers floating away from the station on Aug. 19, 2013, and Russian station officials wanted to determine its origin and insure that the remaining covers are secure. These low-gain antennas are used for proximity and rendezvous operations with the European Space Agency’s Automated Transfer Vehicle. Afterward the two spacewalkers were expected to transfer the communications experiment hardware from its temporary stowage location to the ladder outside the Pirs hatch and split up for the next set of tasks. As he made his way to Zvezda’s hull to begin the relocation of a foot restraint, Yurchikhin was take a look at the three remaining antenna cover locations on the forward end of that module. Once that is complete, he would remove the foot restraint and install it on the new EVA workstation he and Misurkin set up earlier. Meanwhile, Misurkin was to to head over to the Poisk Mini-Research Module-2. There he would use a test kit to collect a particulate sample from under a swath of thermal insulation near Poisk’s hatch. He also was to photograph the SKK materials exposure experiment and associated cabling along Poisk. 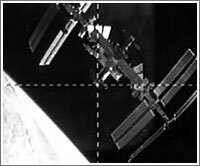 After Misurkin completes the installation of some gap spanners on the port side of Zvezda, he and Yurchikhin were rejoin to transfer the laser communications experiment hardware and the Poisk test samples into the Pirs airlock. For the duration of the spacewalk, Cassidy and station Commander Pavel Vinogradov were isolated to the Poisk module and their Soyuz TMA-08M spacecraft, while Flight Engineers Karen Nyberg of NASA and Luca Parmitano of the European Space Agency will be free to move about the U.S. segment of the complex. This was the 173rd spacewalk in support of space station assembly and maintenance, the 8th in Yurchikhin’s career and the third for Misurkin. Both cosmonauts are wearing blue-striped Orlan spacesuits outfitted with helmet cameras. Their previous excursion outside the station, a 7-hour, 29-minute marathon on Aug. 16 focusing on preparations for the future arrival of the Nauka Multipurpose Laboratory Module, was the longest spacewalk in history conducted by a pair of Russian cosmonauts. On Nov. 1, 2013, Soyuz TMA-09M conducted a short redocking flight in the vicinity of the International Space Station. Fyodor Yurchikhin, Karen Nyberg and Luca Parmitano undocked their Soyuz TMA-09M spacecraft from the Rassvet module on the Earth-facing side of the station at 4:33 a.m. EDT. After backing the vehicle a safe distance away, Soyuz Commander Yurchikhin rotated the Soyuz and began the flyaround to the rear of the station. Carefully aligning the spacecraft with the docking port on the aft end of the Zvezda service module, which was vacated by the European Space Agency’s fourth Automated Transfer Vehicle (ATV) on Oct. 28, Yurchikhin guided the spacecraft in for its docking at 4:54 a.m. The Soyuz move was performed in preparation for the arrival of the Soyuz TMA-11M spacecraft to Rassvet on Nov. 7, 2013, about six hours after their launch from the Baikonur Cosmodrome in Kazakhstan. Three members of the Expedition 37 crew onboard the International Space Station, ISS, including Russian cosmonaut Fyodor Yurchikhin, NASA astronaut Karen Nyberg and a European astronaut Luca Parmitano, returned to Earth on Sunday. Hatches between the station and Soyuz TMA-09M spacecraft were closed at 2:09 p.m. Houston Time on Nov. 10, 2013, NASA announced. Soyuz TMA-09M then departed the ISS as scheduled on Nov. 11, 2013, at 03:26 Moscow Time (Nov. 10, 2013, at 6:26 p.m. EST), undocking from the Zvezda service module, as the two vehicles were flying over Mongolia. 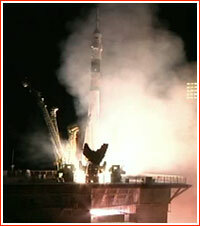 Some three minutes later Soyuz fired its thrusters to increase its distance from the outpost. The four-minute, 45-second deorbiting burn, which would send the spacecraft on its reentry path into the Earth atmosphere, was initiated as scheduled on Nov. 11, 2013, at 05:55:24 Moscow Time (8:55 p.m. EST on Nov. 10, 2013), as the Soyuz TMA-09M was around 12 kilometers from the station. Mission control confirmed a completion of the maneuver. Around 23 minutes later, the descent module carrying the crew separated from the habitation module and the aggregate compartment of the Soyuz TMA-09M spacecraft. A command to release the parachute of the descent module was scheduled for 06:34:48 Moscow Time (9:34 p.m. EST) at an altitude of 10.7 kilometers above the Earth surface. Mission control reported that the operation was completed as scheduled. 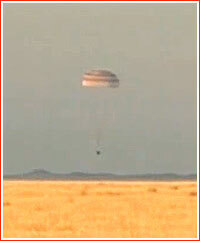 The landing of Soyuz TMA-09M took place as scheduled at 06:49:13 Moscow Time on Nov. 11, 2013, (9:49 p.m. EST on November 10), 147 kilometers southeast from the town of Dzhezkazgan in Kazakhstan. The capsule ended up on its side following the landing. The temperature at the landing site was expected to be 25 degrees F.